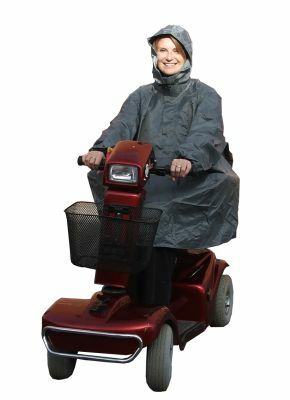 Mobility Scooter Clothing Kozee Mate One Size. The snug fitting hood, comfortable elasticated cuffs and neck line zip combine to offer maximum protection without hazards or restrictions. The hem line is elasticated around the back preventing it from blowing up in a strong wind. The inclusion of the pouch pocket makes this particularly useful garment even better, as it can be carried in the basket at all times.